Looking for an explanation about our regular numbers? Look at decimal numbers. The Roman numeral system is the most well-known system that is not a positional system. It is an additive system. The system has no symbol for zero and does not use negative numbers. The original rules were that the value of individual symbols are added unless a symbol with a lower value comes before a value with a higher value. In that case the lower value is subtracted from the higher value. V, L and D are only allowed once in a number. The numbers are written from high to low. - At most three times the same symbol in succession. - At most one lower symbol in front of a higher symbol. - V, L and D are not used to subtract, so not VC but XCV. On clocks you often see IIII instead of IV for four. The most heard explanation is that IV were the first letters of Jupiter (IVPITER in Latin) and therefore not used. 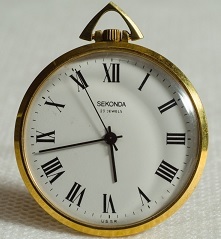 An other reason can be that IV is often upside down on a clock. It may be confused with VI. The IIII also gives a certain symmetry. As you have I, II, III, IIII (= four numerals with I), V, VI, VII, VIII (= four numerals with V) and IX, X, XI, XII (= four numerals with X). If you strictly uphold all rules, the biggest number possible is MMMCMXCIX = 3999, as you can only use M three times in succession. On Wikipedia they explain two ways. The binary number system is base-2 positional numeral system. The symbols 0 and 1 are used as digits. Such a digit is called a bit. A binary number with eight bits is called a byte. Therefore 8 b = 1 B. In the decimal system 9 is incremented to 10 and 99 incremented to 100. In the binary system it also works like this, as there is only 0 and 1 a 1 is immediately incremented to 10 and 11 incremented to 100. In the binary number, the value of each digit is a power of 2. If necessary, compare this to the table for the decimal positional system at the top of the page. To avoid confusion you can use a subscript number to show in which number system the number is written. In our example this will look like this: 100111012 = 15710. The octal number system is a base-8 positional numeral system. The symbols 0 to 7 are used as digits. In Dutch primary schools this numeral system is sometimes taught as: 'Het land van Oct', which translates in 'The country of Oct'. Oct is sometimes written as Okt. It learn the children more insight in to the workings of a positional system. You cannot rely on your memory anymore, but really have to use arithmetic. For this reason the teacher is also able to recognise gaps in the thinking process with the (decimal) positional system. 10 is pronounced oct, 11 as oct-one, 12 as oct-two and 20 is pronounced two-oct. From 100 on it varies. In most cases 100 is a board (8×8) and 1000 a block (8×8×8). In the decimal system 9 is incremented to 10 and 99 incremented to 100. In the octal system it also works like this. A 7 is incremented to 10, 17 to 20 and 77 to 100. The octal number 45 has the decimal value 4 × 8 + 5 = 37. The octal number 371 has the decimal value 3 × 64 + 7 × 8 + 1 = 249. In the octal system, the value of each digit is a power of 8. The Babylonian numeral system is the oldest known positional numeral system. They worked with a base-60 (sexagesimal) number system. Luckily they did not use 60 different digits, but used an additive system in which stood for 1 and for 10. These symbols come from cuneiform and are pronounced as nail and hook. They used a wedge-tipped stylus to make these in clay tablets. The symbols are grouped when there are more than three. Below you can see the numbers 1 to 60. 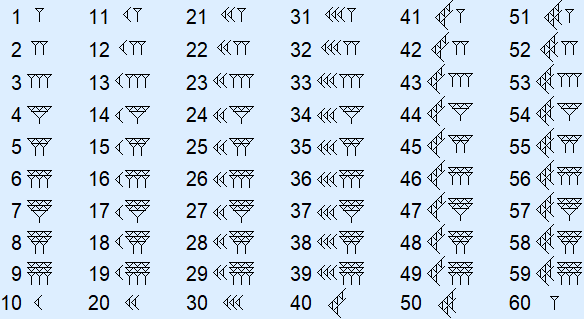 As you can see, the Babylonian numerals for 1 and 60 are the same. This is because 6010 is written 1060 in the sexagesimal system. However, the Babylonians had no symbol for zero. Therefore, only the was written with an (invisible) space behind it. For this reason 61 is written as two nails with a space in between. You can see this in the last example at the bottom of the page. The number has the decimal value 60 + 25 = 85. The number has the decimal value 13 × 60 + 46 = 826. In the sexagesimal system, the value of each digit is a power of 60. Do you have to write a lot of Babylonian numerals? Write a hook just as < and a nail as |. It looks like a very difficult number system but imagine they were used to this, just like we are used to our decimal system. The fact that angles are divided in 360° and time in 60 minutes and 60 seconds are thanks to this system. Furthermore, you will see that adding and subtracting will work the same in every positional system. One of the possible reasons 60 was chosen is because 60 has so many divisors. It has 1, 2, 3, 4, 5, 6, 10, 12, 15, 20, 30 and 60 as its divisors. Let us first look at how it works in our normal decimal system. Below you see how adding works for 30 728 + 42 744 and 174 213 + 894 892. Because 8 + 4 = 12 you write the 2 under the line and you have to 'carry 1' to the next digit, in this case the tens. You can write these above that column (here in red). At the hundreds you get 7 + 7 = 14. You write the 4 under the line and carry 1 to the next column, the thousands. Works exactly the same. Because there are only two digits, there is a higher probability you will have to carry 1. Works exaxtly the same. If your digit exceeds 7 you will have to carry 1. Let us look at the left hand example. Because 4 + 6 = 12 (oct-two) you write the 2 under the line and have to carry 1 to the next column. There you get 1 + 7 + 5 = 15 (oct-five). You write the 5 under the line and carry 1. In the last column you get 5 + 7 = 14 (oct-four). Works according to the same principal! If you exceed 9 nails you will have to carry a and if you exceed 5 hooks you remove 6 hooks and carry a '. First you add the number of nails in the most right hand column. There are 2 + 6 = 8 nails. Write these under the line. Proceed with the next column. Here are 3 + 4 = 7 hooks. This is one more than six, so you write down one hook under the line and carry one . In the next column you get 1 + 6 + 5 = 12 nails. You write 2 nails under the line and carry one hook. For the hooks you get 1 + 1 + 2 = 4 hooks. First add the nails in the most right hand column. There are 4 + 7 = 11 nails. You write one nail and carry one hook to the next column. There you get 1 + 1 + 3 = 5 hooks. In the next column you have nails again. 7 + 5 = 12 nails. You write two nails and carry one hook to the next column. There you get 1 + 3 + 5 = 9 hooks. This is three more than six, so you write three hooks under the line and carry one nail. Nothing is added to this, so this will also be the result under the line. Example 3: no zero makes for a confusing number! 9 + 6 = 15 so write 5 nails and carry a hook. 1 + 5 + 3 = 9 so write 3 hooks (more than 6) and carry a nail. 1 + 6 + 3 = 10 so only carry a hook, as there is no symbol for zero. 1 + 4 + 1 = 6 so only carry a nail, as there is no symbol for zero. 1 + 6 + 0 = 7 so write 7 nails. 1 + 3 = 4 so write 4 hooks. We mean 47 × 602 + 0 × 60 + 35 × 1 = 169 235. However, because the zero is not there, somebody might think it means: 47 × 60 + 35 × 1 = 2855. The Babylonians did apparently not worry to much about this, probably because from the context you could always figure out the value of a numeral. They used these numerals even as 'decimals' but had no decimal separator either! There are therefore even more possible interpretations of this Babylonian numeral. On the dots you can fill in higher powers of 60. However they did not use it at the end of numbers. A single nail could therefore still be 3600, 60, 1, et cetera. The placeholder is therefore not a true 'zero'. So be thankful for the zero and the decimal separator!